Lottery Post is the world's largest community of lottery players, and has more daily visitors than any lottery-related website in the world. Back in 1999, when Speednet Group began construction of Lottery Post, people seeking information about lotteries on the Web could end up frustrated by a lack of online support. Lottery players often felt cut off from others who enjoyed their hobby, since the technologists who typically built Web sites at the time did not really understand lottery players and their needs. It was a grossly under-served market. Lottery Post started as a simple online forum where lottery players could communicate about strategies, methods, predictions, mathematics, and other lottery-related topics. Over time, as Speednet continued adding innovative, original features, technology, and content to the site, Lottery Post attracted new members through word of mouth and general search engine traffic, and grew into a thriving community. We are proud of our site that attracts and keeps members based upon excellent, unique content and features — not because of slick marketing campaigns and other gimmicks designed to create traffic spikes. We are particularly proud of our traffic statistics, which we openly provide. Our Lottery Results Data Feed grew out of our work on Lottery Post, and has helped us to become one of the fastest, most accurate lottery results providers on the market today. 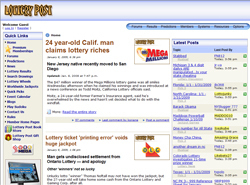 USA Mega is the Web's most popular multi-state lottery site. 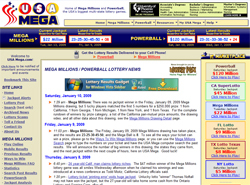 The Web site was launched in May of 2000 as BigGameLottery.com, in response to the near absence of online information for The Big Game, a huge multi-state lottery game that would later be renamed "Mega Millions". We displayed the latest and all past drawing results for the game, statistics, playing instructions, FAQs, and lottery industry news. The response was dramatic, as lottery players worldwide finally has a place to go for multi-state lottery information, and our traffic exploded. We soon added a Jackpot Alert feature to send e-mails to registrants when the jackpot reached a level of their choosing — a unique invention on our part that is now copied by practically every lottery Web site. Yahoo! subsequently named us Incredibly Useful Site of the Day. A couple of years later, we added the United State's other major multi-state game — Powerball — and re-named the site to USA Mega. Today, our site remains a staple for every lottery enthusiast.